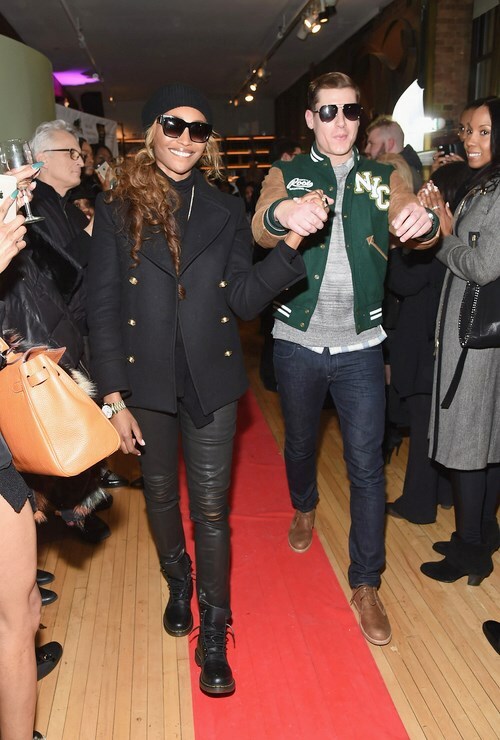 The reality TV stars continue to flock to New York Fashion Week, and one in particular, Real Housewives of Atlanta star Cynthia Bailey, decided to get in on the action with a (impromptu?) Cynthia Bailey Eyewear fashion show. Between the tight space and the plastic runway I can’t help but think Cynthia‘s show was held in the lobby of her hotel – without permission – and she lucked out when Mother Funders‘ Carla Stephens and Real Housewives of New York‘s Jill Zarin stumbled upon the “show” so Cynthia could pose for pictures with the “stars” who attended her show. Poor Cynthia. If I could stop laughing, I might feel sorry for her. Look below for more photos from Cynthia‘s show, as well as Kylie Jenner and Kendall Jenner at the Vera Wang fashion show, Dorinda Medley, Luann de Lesseps, and Kristen Taekman at the Georgine Fall fashion show, and more. New York Fashion Week is in full swing – and not even the bitter cold temps in New York City this past weekend could keep the reality TV stars away. Teen Mom star Farrah Abraham and her daughter, Sophia, were front and center this week along with Mother Funders star Carla Stephens, the Real Housewives of New Jersey‘s Kim DePaola, and Game of Crowns star Susanna Paliotta. Elsewhere, Gigi Hadid and Bella Hadid showed off Rihanna‘s new collection, and Sadie Robertson walked for Sherri Hill. Also spotted around town, Gail Simmons, EJ Johnson, Kelly Bensimon, Phaedra Parks, Rachel Zoe, Kim Kardashian, Geneva Thomas, and more. Check out the pics below. Below you’ll find pics from Cameran Eubanks, Kenya Moore, Tom Schwartz, Carole Radziwill, Jennifer Williams, Luis D. Ortiz, Kris Jenner, and more. Bravo‘s new reality series Mother Funders premieres this Sunday. The cast of PTO moms includes LaShon Thompson, Shana Koorse, Shayzon Prince, Carla Stephens, Robin Dyke, Amber Bryant, and Amber Coulter. I’m sold. I haven’t been this excited about a new Bravo show since Ladies of London. As a PTO mom myself (haha! don’t judge me! ), I am intrigued, and I also hope Mother Funders is a suitable replacement for Lifetime’s now- canceled Pretty Wicked Moms, which I loved. Take a look below to meet the cast and watch an exclusive clip from Mother Funders‘ first episode.